Don't think twice about reporting a bug, feel free to post every detail, but please make sure the report is clear and specific, if the bug is a game crash, a savestate would help to recreate it and see whats wrong. Details of your system are also important, you can save the System Information that FBA generates as a text file and attach it with your report. If you have any images / screenshot of the bugs they are very useful as well. Remember to follow the Forum rules always when posting anything here. If possible, also please attach a save state and screenshots! When i deactivate the autoframe skip i got the "guru meditation"
I received a bug with some kaillera clients earlier, both official and unofficial. And FBA crashes with guru meditation when i do change the connection settings and try to refresh the server list! That happens only when the firewall temporary allows the connection. Tested different kailleraclient.dll files with temporary allowed firewall policy. The dlls marked as WORKS still crashes randomly if the connection is not allowed in the firewall exceptions. Only okai November 02 2007 release works even if you temporary allow the connection to the server and don't crashes after refreshing the list. I've continue testing different kailleraclient.dll files and crashes stops when kailleraclient.dll is added as exception in the firewall policy. Every client should WORK, ONLY IF you permanently allow the connection to kaillera server, otherwise it crashes when you change the connection settings and try to refresh the list. Well that never happened in the earlier versions of FB Alpha, that is why I'm posting this, I'm sure that the problem is not in FBA itself still I think that the info can be useful now. 1) final burn alpha do not recognize the rom . 2) We can still play , but there is no sound . There is no sound problem with pulstar...Just be sure to got the latest Pulstar ROM because in MAME 0.143u4, the V1 has been updated. ok, I made the right rom but there is always a problem . I believe I have fixed this. Can you confirm that the error only happens with the DirectSound3 audio plugin and not with the XAudio2 plugin? 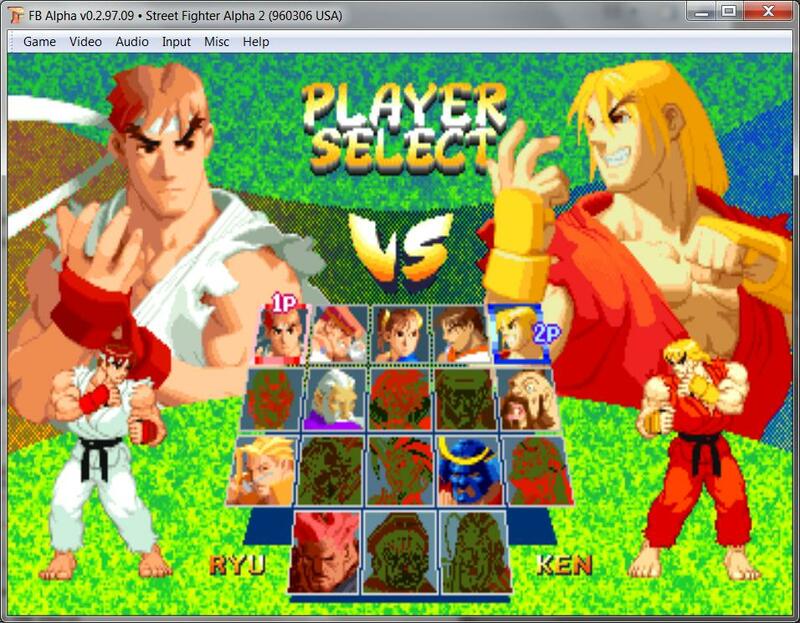 About CPS3 loading roms, I have all roms here matching with last mame romsets but when loading any set it give me like I donÂ´t have any and I guess if the FBA isnÂ´t recognizing those because of roms name. â€¢ essential program ROM 10 was not found. â€¢ graphics ROM 30 was not found. â€¢ graphics ROM 31 was not found. â€¢ graphics ROM 40 was not found. â€¢ graphics ROM 41 was not found. â€¢ graphics ROM 50 was not found. Seeing inside of zip file redearth.zip no roms labeled like FBA insists to search are on it, same for other cps3 sets. MAME loads from CHDs for CPS-3. FBA uses the roms from the CHDs, so having just the MAME sets isn't enough for CPS-3. On the hellfire title screen the background is dark red where it should be black. Thanks - fixed that one. Regarding the pacman and mspacman drivers; I notice that these games are classed by the emulator as horizontally orientated. They display in their correct 3:4 ratio but to be accurate should they not be outputting a 4:3 rotated screen like other vertical games?